Numerous clinical studies have shown that fat cells cannot survive in extremely low temperatures. This led to Harvard scientists inventing Cryolipolysis commonly known as fat freezing, a non-invasive alternative to liposuction that uses extremely low temperatures to permanently kill fat cells safely so your body can eliminate them naturally. ZELTIQ introduced Coolsculpting in Brisbane which was the the first commercialized machine in Australia. Coolsculpting became popular in the United States beginning in 2004. Since then, Cryolipolysis technology has greatly improved and today’s most technologically advanced system is called Clatuu. 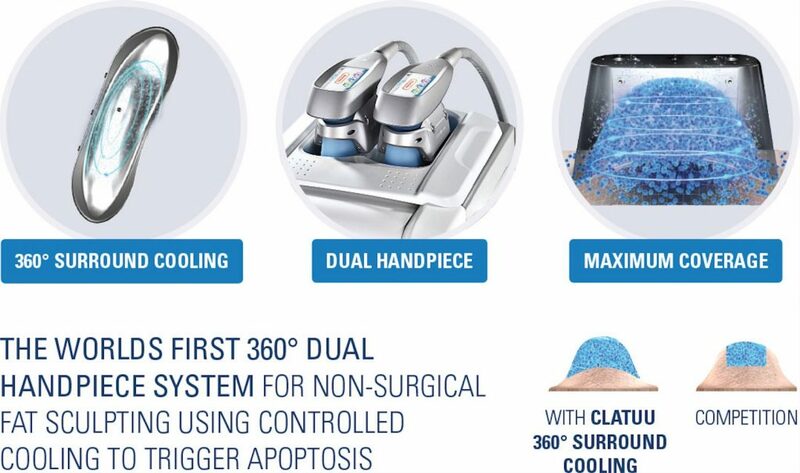 As the world’s first patented 360 ° cooling applicator and dual handpiece system, Clatuu saves clients time and money by treating both sides of an area at once (single handpiece systems treat one side at a time). The 360 ° applicators are also more effective at eliminating fat than the one-sided cooling applicators of traditional devices. Clatuu is the latest fat freezing cooling technology which uses a special 360 ° applicator to target stubborn fat that is resistant to changes in diet and exercise, effectively freezing, destroying, and permanently eliminating the fat cells beneath the skin without damaging the surrounding layers. A single treatment typically reduces 25-30% of the target area’s fat content by crystallizing (freezing) fat cells at maximum temperatures of -9°C, which then die and are naturally eliminated by your body through the waste process. Your body will continue to eliminate these fat cells through the lymphatic system and liver for up to six months post treatment, with optimal results seen around the 6-8 week mark. Will Fat Freezing Work For Me? Both men and women can utilise Clatuu 360 ° for stubborn fat removal, fat freezing, and body contouring for most areas of the body such as the waist, stomach, arms, thighs, hips, and buttocks. Cryolipolysis is most effective for people who have stubborn pockets of fat that are resistant to diet and exercise, and least effective for obese patients who have large amounts of fat to lose. Opting for the Clatuu 360 ° means you’ll not only avoid surgery and down time, you’ll also save money and see dramatic results at around four weeks as your body begins to naturally flush out the fatty deposits targeted during your treatment sessions. Book a free consultation with us to see if fat freezing suitable for you. Cryolipolysis does not require any special preparation. Before the session, an evaluation is carried out, in order for the healthcare professional to access the treatment of the target area. The correct placement of the applicator is of great importance for the success of the treatment. The treatment process is usually painless, fast, comfortable, and in some cases only a single session is needed to achieve the desired results. It does not require any kind of anesthesia. You just rest comfortably in the therapeutic bed and the heads of the CLATUU® are applied. Special membranes protect your skin against the risk of ice burn. The session lasts no more than 1 hour. In the meantime, you lie down comfortably and you can read a magazine, work on your laptop, or navigate the internet. After the removal of the heads, the healthcare professional massages the treated area to activate the microcirculation. What is the downtime and the side effects? Fat Freezing is a non-invasive process, with no downtime. You can return to your daily activities immediately, including sports, even on the same day of treatment. A rare side effect is a little swelling and redness in the area of the skin where it comes in contact with the heads that usually resolve within 24-36 hours. Bruises can occur in people who have a predisposition to easy bruising but they usually fade away within 7-14 days. The treated area starts to shrink within the first 20 days with the end result to be visible at 90 days. Up to a whopping 30% of local fat loss is can be expected and the results are permanent. If you follow a balanced diet and adopt a healthy lifestyle, the results will be consolidated and your new body will be visually improved. This depends on the cryolipolysis. There are devices that require repeated sessions every month. The leading CLATUU ™ device achieves the desired effect from a single session. However, if there is extended area of local fat and if you desire it, a second session can be scheduled after 6-12weeks. The cost per treatment area ranges between $400-$800 depending on the size of the area treated. Book a free consultation with our team to find out if this treatment is right for you. During your consultation we will provide you with a clear treatment plan to achieve your desired body goal inclucive of pricing. Why to choose cryolypolysis over liposuction? The two treatments have a different purpose. Liposuction is a surgical method of removing fat through surgery under anesthesia and aims at removing large amounts of fat and reducing body weight. It is a usual operation with all the possible side effects and complications that a surgical procedure may entail. On the other hand, cryolipolysis is a non-invasive method that reduces localized fat deposits and contours the body with minimal adverse effects. How Do I Book A Free Consultation? If you want to learn how fat freezing can help you enjoy a more toned, sculpted appearance book a free consultation today and we will work carefully with you to create a personalized treatment plan to leaving you looking great and feeling confident.